Vectis Karma now stocks the three new Fragrances that Nippon Kodo have recently added to their popular Morning Star range. We now have in stock, in boxes of 50 Sticks, the following 21 Fragrances in the Morning Star range: Sandalwood, Pine, Musk, Patchouli, Jasmine, Rose, Cedarwood, Amber, Vanilla, Green Tea, Lavender, Cinnamon, Lotus, Mimosa, Yuzu, Gardenia, Iris, Fig, Frankincense, Myrrh and Sage. Many of these are also available in boxes of 200 - please browse the Morning Star section of our shop for more details. 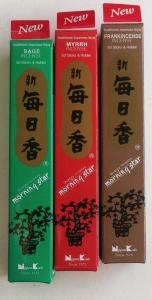 Morning Star Incense continues to be very popular with our customers, so we're pleased that this range has 3 new fragrances. This range offers great value for money, clean burning, little smoke with powerful and pure scents.